Can You Lose Weight by Rollerblading? Rollerblading is a low-impact exercise activity that utilizes inline skates and requires you to use your legs to propel yourself forward. There are many health benefits to consistently rollerblading, such as building cardiovascular fitness and burning calories. It offers an effective exercise option for those who don’t necessarily enjoy running. To lose weight, you need to make some adjustments to how many calories you’re burning and how many you’re consuming. For every pound of fat loss, you must burn 3,500 more calories than you receive from food and drink over a period of time. You burn more calories by participating in consistent exercise. 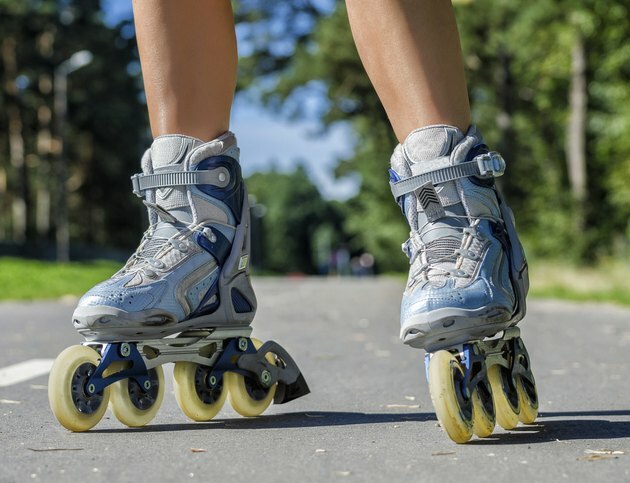 Cardiovascular activities like rollerblading require you to continuously move over a period of time and therefore cause you to burn a significant amount of calories. Every rollerblading workout you complete contributes to the total amount of calories that you burn and therefore helps you build a caloric deficit, promoting weight loss. Rollerblading is one of the most efficient cardiovascular activities you can do in terms of burning the most calories per unit of time. A 155-lb. person will burn about 260 calories in 30 minutes of rollerblading. If you’re larger, you’ll burn more calories, and if you’re smaller, you’ll burn less. For your rollerblading workouts to be effective in helping you burn calories and thus lose weight, each session should last at least 30 minutes. The Department of Health and Human Services recommends that adults receive at least 2 ½ hours of moderate cardiovascular activity, or 1 ¼ hours of vigorous cardiovascular activity per week. Therefore, complete four to five workouts lasting at least 30 minutes per week. Consideration needs to be made towards your nutritional habits. While rollerblading will contribute to creating a caloric deficit and thus help you lose weight, the other half of the equation consists of how many calories you’re consuming. It’s not difficult to quickly cancel out the amount of calories you’ve burned through rollerblading by eating a high-calorie meal. Make healthy food and drink choices to facilitate your weight loss. What Exercises Amount to Burning 1,500 Calories a Day?